We are pleased to reveal the digital original titles that have generated the highest average demand in Latin America as a whole, as well as Brazil and Argentina for the period May, June and July 2018. 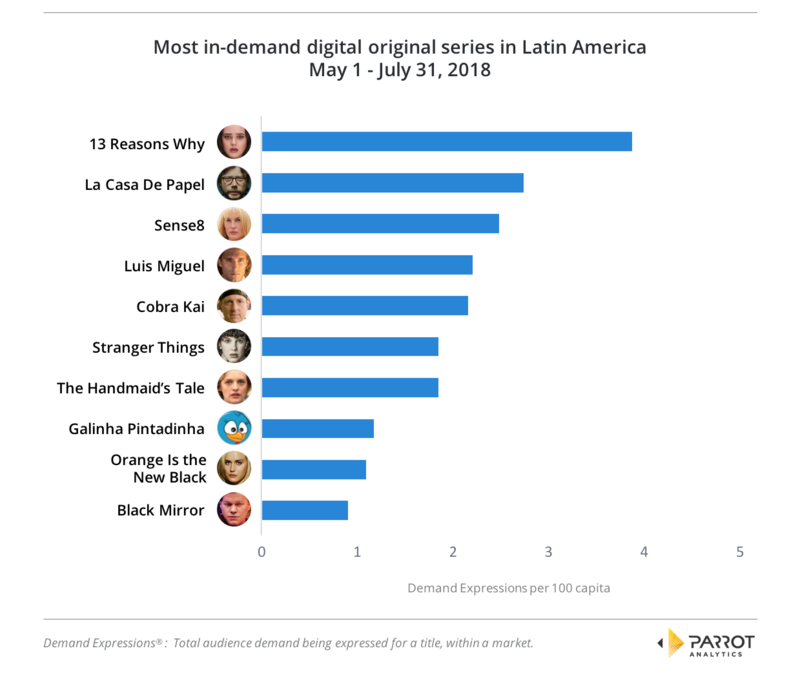 Over the entire LATAM region, the most in-demand digital original title for the May to July 2018 period is teen drama 13 Reasons Why with 3.87 average daily Demand Expressions per 100 capita (DEX/c); it is approximately 1.4 times more popular than Spanish-language crime drama Money Heist (La Casa De Papel). Demand for La Casa De Papel has remained high after the April release of the second season in the region. Third highest in demand is the sci-fi drama Sense8, due to the show’s finale special in June. All these top three titles are available on Netflix in the region. 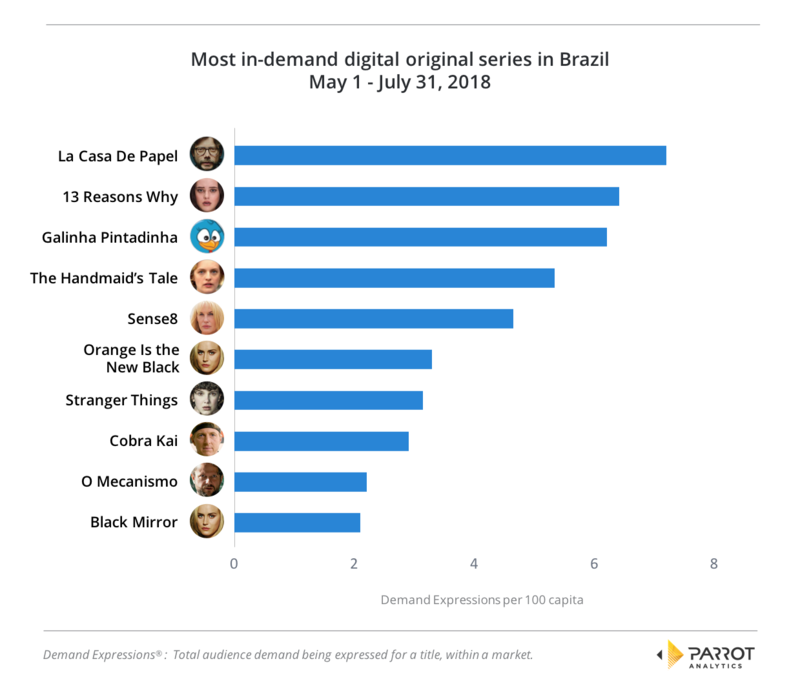 The non-Netflix show with the highest demand in Latin America is YouTube Premium’s Cobra Kai, which is the fifth most in-demand title, followed by Hulu’s The Handmaid’s Tale and the Netflix-Telemundo co-production Luis Miguel, la serie. 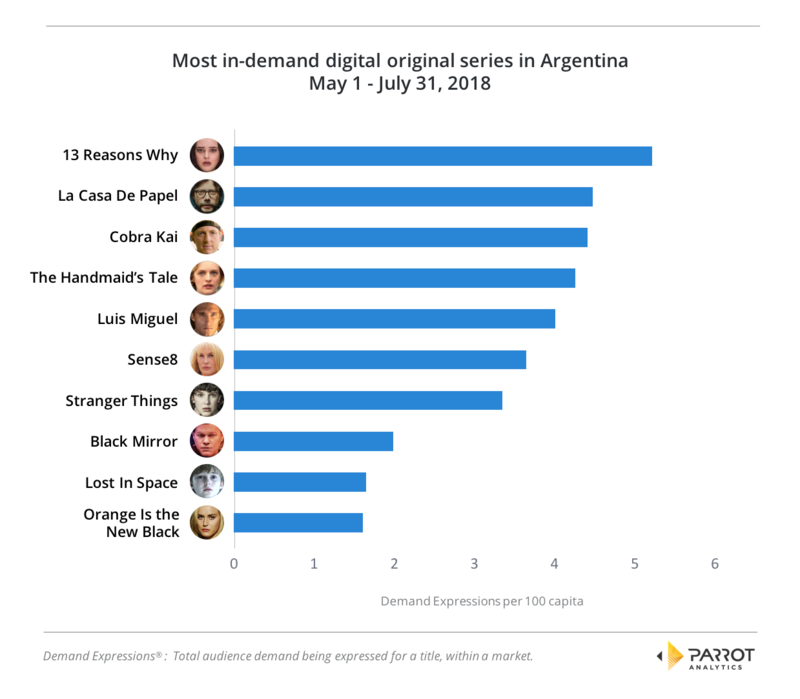 In Argentina, demand is higher for Cobra Kai than in LATAM generally. It ranks third by demand in this market (and as stated earlier fifth in LATAM as a whole). Argentina also differs from LATAM as a whole by having higher demand for the Netflix sci-fi revival Lost In Space, which is the ninth most in-demand digital original title in the market. Brazil, in turn, has high demand for two local digital original series, Brazilian children’s title Galinha Pintadinha and political drama O Mecanismo. Finally, we examine genre trends for digital original titles in Argentina and Brazil. By summing the demand over the period May to July 2018 for every show in a genre, we can determine what percentage of the total demand for digital original series comes from shows in that genre; this is called the digital original demand share of each genre. By analyzing the demand share, we can see which genres are finding the biggest audiences and how tastes in each market are changing month-by-month: In both countries, the demand share for Drama digital original titles dropped each month, but the share of nearly every other genre grew. 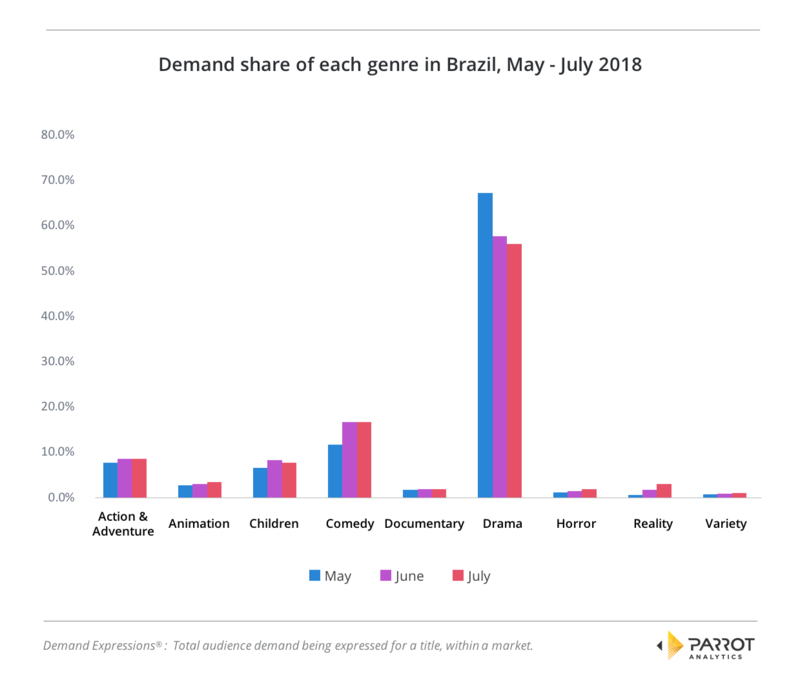 The major exceptions are the demand share for titles for Children, which dropped in both countries from June to July and Action and Adventure, which overall grew in Brazil but stayed roughly the same across the three months in Argentina. This finding is not a surprise. Most SVOD services started commissioning original series with premium drama titles, but after finding success in that field have increasingly been ordering more diverse shows in all genres. In both these Latin American countries, the biggest increase in demand share has been for digital original comedy series. 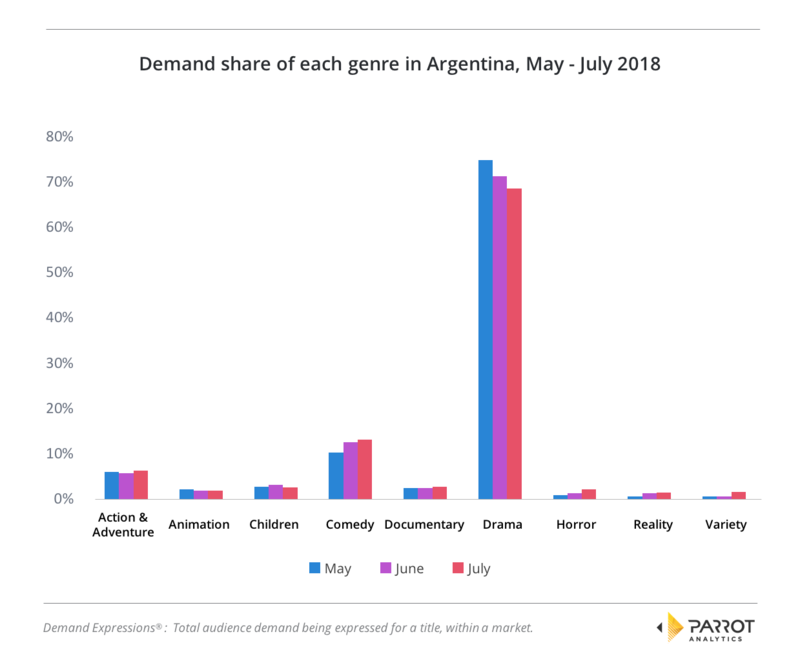 From May to July 2018, the comedy genre grew from 10.1% of digital original series demand to 13.2% in Argentina and from 11.7% to 16.7% in Brazil. For more information, reach out to Parrot Analytics for a live demonstration our Demand Portal, or watch our latest product video.